Alsahwa Net- King Salman Humanitarian Aid and Relief Centre (KSrelief) has denounced the Houthi attack on Yemeni internally displaced persons in the district of Haradh in Hajjah governorate. It depicted the incident as a gross crime, asserting that it follow up its consequences with the Yemeni authorities in Hajjah. 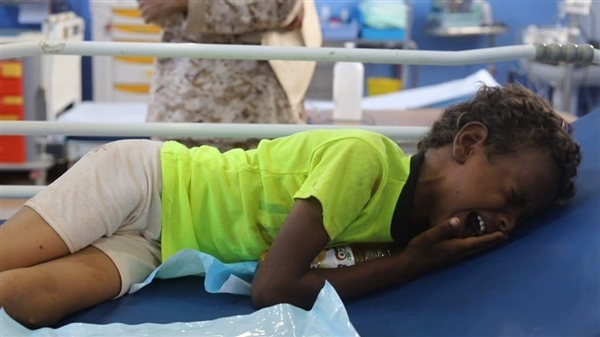 KSrelief asserted that the Iran-backed houth rebels indiscriminately bombard Yemeni areas, ignoring all human rights principles, treaties and conventions. It called all UN and international human organizations to shoulder their responsibilities towards the Houthi atrocities, emphasizing that Yemenis severely suffer of the Houthis’ criminal acts. Houthi militias on Saturday committed a massacres against internally displaced persons (IDPs) in the district of Haradh in Hajjah governorate. Local sources told Alsahwa Net that seven IDPs were killed and other 30 were wounded, most of them are children and women. The sources anticipated that the figure of the killed might increase, pointing out that some IDPs were seriously injured.